This postdoctorate is at the core of the prospective project PPM (Ensemble Prediction of atmospheric Pollutant dispersion for Micro- meteorological applications) funded by the STAE fundation (http://www.fondation-stae.net/) from IRT Saint-Exupéry and led in collaboration between several research institutes (CERFACS, CNRM/research center of Météo-France, ONERA, CEREA). This projects aims at better formulatingvelocity and turbulence boundary conditions for micro-meteorological models. A particular interest is on the mesoscale contribution to the uncertainties at microscale for application to atmospheric dispersion of air pollutants. 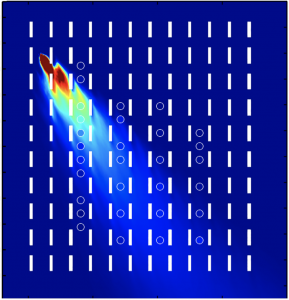 The goal is to design a strategy to produce tracer concentration maps from an ensemble of Large Eddy Simulations (LES) carried out at micro-scale with varying boundary conditions that are influenced by the mesoscale. This ensemble of LES will be combined with machine learning approaches (emulator/surrogate, dimension reduction, sensitivity indices) to estimate an industrial risk with an improved accuracy and a reduced computational cost. In the framework of the PPM project, this industrial risk corresponds to the probability of having a pollutant concentration that goes over a certain threshold at a given location. The ultimate goal is to show the added value of LES and machine learning under uncertainty to better assess individual exposition to air pollution. In this context, the target of the postdoctoral fellowship is to design and analyze an ensemble of LES with different CFD solvers (AVBP, YALES2, Meso-NH, CODE_SATURNE) to simulate pollutant atmospheric dispersion in the context of the MUST experiment (http://mech.utah.edu/~pardyjak/must.php). In this experiment, the tracer dispersion is directly impacted by the presence of containers that mimic an idealized urban canopy. The size of the micro-scale computational domain is on the order of 200 m with a spatial resolution on the order of 1 m. This ensemble of LES will be generated by perturbing boundary conditions in order to represent the meso-scale meteorological variability. 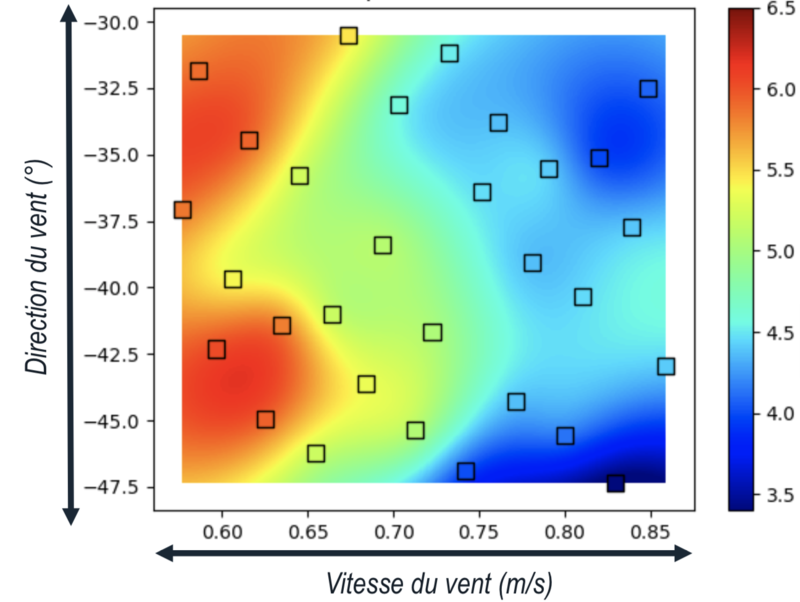 The key idea is to accurately represent how tracer concentration changes within the urban canopy with respect to variations in the wind velocity given as boundary conditions to the micro-scale domain. To carry out this analysis, we will build an emulator of the LES codes through machine learning methods. This emulator provides a way to quantify efficiently the uncertainty in the tracer concentration and also ti measure the concentration sensitivity to the meso-scale boundary conditions. Due to the computational cost of environmental LES, the size of the ensemble is limited (< 100). Using an emulator allows to obtain accurate statistics by exploiting at best, the available ensemble of LES. In summary, in this postdoctoral fellowship, the objective is to generate a multi-model ensemble of LES and to use this dataset to build an emulator from which tracer concentration statistics and a map indicating the probability to exceed a certain threshold could be retrieved. This project is considered as very innovative in the sense that it combines high-fidelity CFD simulations and machine learning approaches for a high-dimensional problem (large computational domain, long computational time). This is therefore a scientific computing challenge to answer industrial safety issues. The future postdoctoral fellow will benefit from CERFACS’ strong expertise (in CFD, atmospheric flow modeling and machine learning under uncertainty) to make progress in this project. 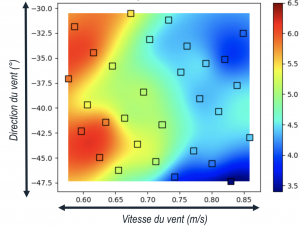 It is worth mentioning that a first ensemble of simulations was carried out using YALES2 (see Figure 1) and that a preliminary sensitivity analysis was carried out to compute tracer concentration sensitivity to the wind velocity magnitude and direction specified as boundary conditions using a gaussian process emulator (see Figure 2). This preliminary work demonstrated the feasibility of building emulators suitable for environmental LES. Here the key idea is to extend this sensitivity analysis to a multi-model ensemble and to analyze the contributions of each LES code. The strategy developed by the postdoctorate fellow could then be applied to the urban case and to the airport case developed in parallel by the PPM project partners (CNRM, ONERA, CEREA). Figure 1 – Mean tracer concentration (ppm) field at height z = 1,6 m obtain from YALES2 LES and comparison to sensor data (symbols). Figure 2 – Tracer concentration (ppm) at a given point simulated by a Gaussian Process emulator built using a training set made of 30 YALES2 LES (symbols) for varying wind boundary conditions. The candidate should have a strong experience in computational fluid dynamics (LES and/or atmospheric flow modeling) and/or machine learning. A good team spirit and initiatives are highly recommended to ensure the success of this emerging project. Contributions to ongoing research project and to new project elaborations are also expected. 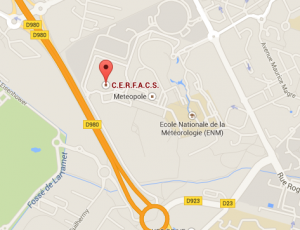 The candidate will be hired by IRT Saint-Exupéry, but the job will take place at CERFACS (Météo-France campus, 42 Avenue Gaspard Coriolis, Toulouse) within the framework of the PPM project. collaboration with PPM project partners (CNRM, ONERA, CEREA).